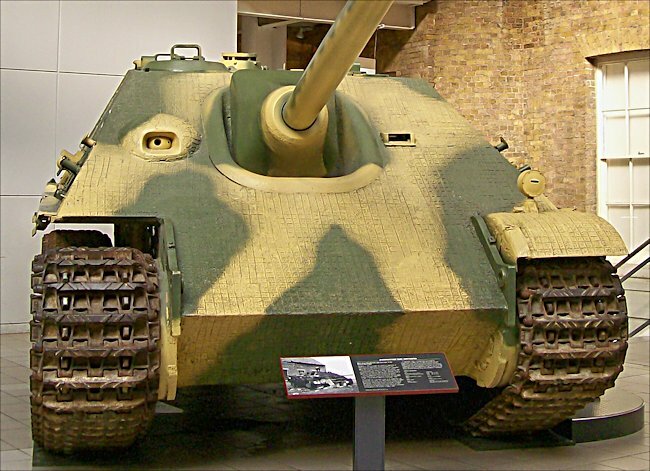 This German WW2 Jagdpanzer V Tank Destroyer used to be on display at the Imperial War Museum London up until 2014. It is now in storage at the Imperial War Museum Duxford. This German tank destroyer was built as a Jagdpanther command vehicle by MIAG in July 1944. It belonged to sPzAbt 559 (heavy tank battalion 559) and was put out of action by a British Cromwell tank near Hechtel (Belgium) in September, 1944. 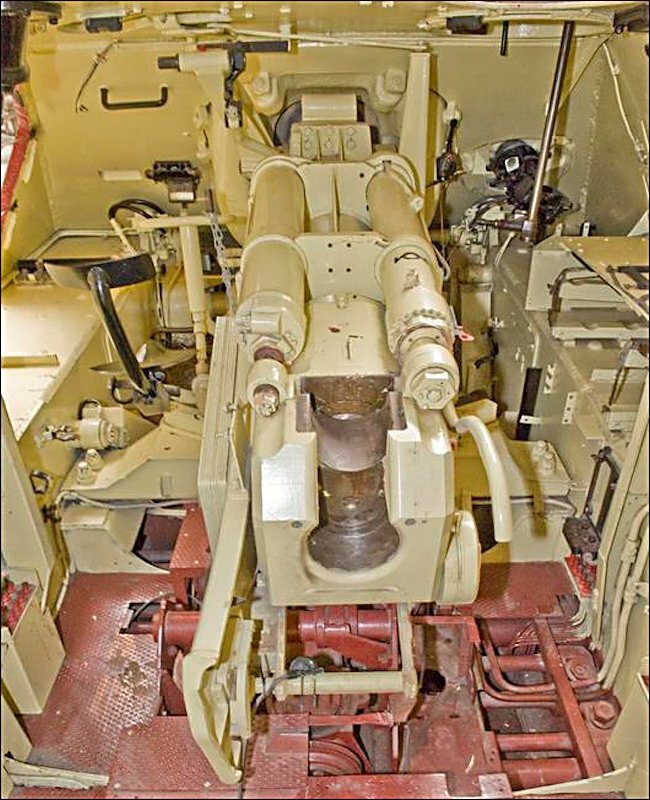 It was knocked out by one 75mm shell fired into its engine compartment and another three into the fighting compartment, on the right hand side. It was acquired by the Imperial War Museum in London in 1969 from the RMCS at Shrivenham. It is based on an early production Jagdpanther. Part of its left-hand superstructure has been cut away to display the interior. It has been restored to running order using parts of the engine from the Jagdpanther recovered from Pirbright ranges. It had tactical number “01” and chassis number 300054. Although only a single Battalion of Jagdpanthers served in Normandy, they made a big impression on the Allied armoured divisions. Designed as a heavy tank destroyer using the Panther tank chassis, it was fitted with the 88mm Pak 43 gun that was used on the King Tiger tank. This was the same gun that was being used by infantry anti-tank units since 1943. Although very heavy and cumbersome, it's very high muzzle velocity enabled it to penetrate the armour of any Russian or Allied tank is a range of 3,000m. The 88mm Pak 43 gun was an evolution of the famous 88mm flaK 36 gun. It had the same caliber was a much more powerful gun. It use a longer and heavier shell. Hitler had wanted it fitted to the Tiger I tank but the turret was just too small. It was fitted to the Nashorn and Ferdinand tank destroyers but their armour was not thick enough to survive a tank on tank battle at close quarters. 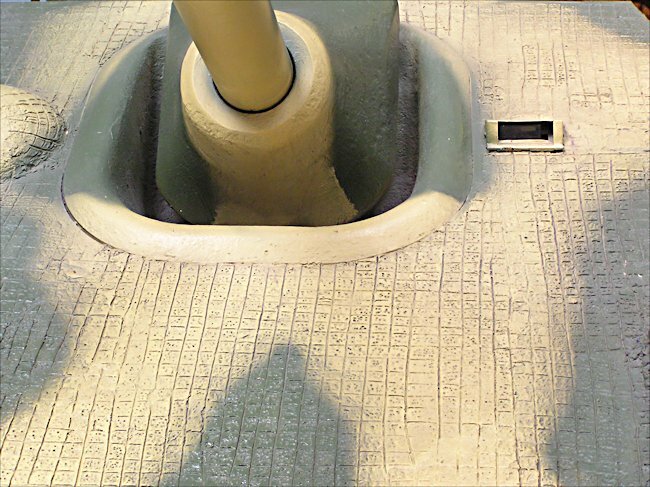 The fighting compartment of the Jagdpanther had been constructed by increasing the height of the side and front armour plate on the Panther tank. Just 392 were produced. The supply was never able to meet the demand. On the 30th July 1940, in Normandy, just two Jagdpanther had ambushed a squadron of Churchill tanks belonging to the 6th Guards Tank Brigade. Within the space of a few minutes 10 Churchill tanks have been knocked out before return fire knocked out both Jagdpanthers. 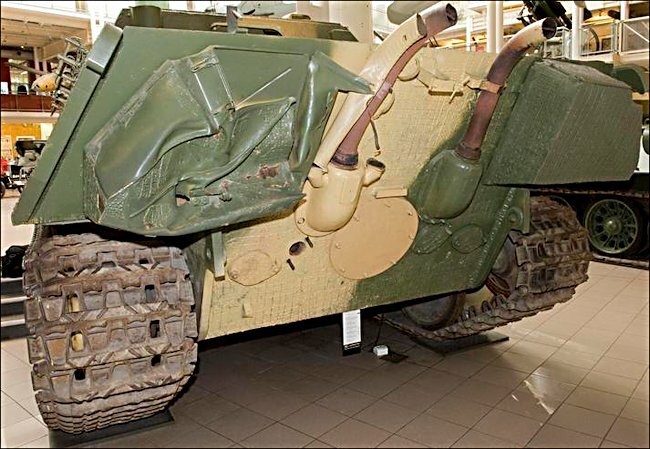 The success of this tank was because of the lessons learned Russian tank design. Sloping armour, a big gun and wide tracks made this machine lethal. It was one of the best ambush weapons of World War II. It had very angled frontal armour that sloped back at 35°. This effectively increase the thickness of the armour that a shell travelling horizontally would have to penetrate for no additional weight. It was 80mm thick, but thanks the angle it effectively becomes 140mm thick. The added bonus was that many shells would bounced off the metal plate because it was angled so steeply. 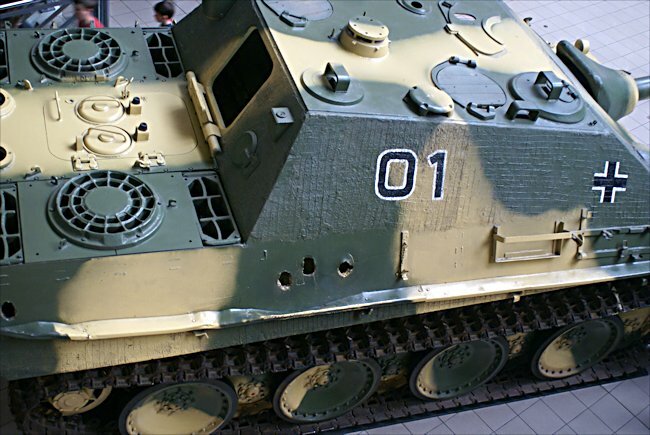 The rest of the Jagdpanther tank destroyers armour was only 40 mm thick but it two was angled to increases its protective performance. 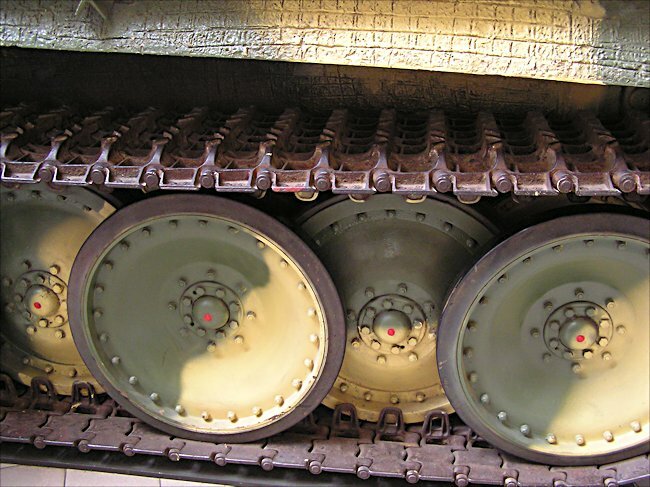 Major hull armour plates were also interlocked and welded together to give extra strength. One of the only Allied fighting vehicles in 1944 that could penetrate the frontal armour of a Jagdpanther was the American M36 Jackson Tank Destroyer with its 90 mm gun. Not having a turret would at first seem a hindrance. The gun had a lateral traverse of 22°. This meant that at a distance of one and half kilometers it could cover a battlefront of 600 m without having to reposition. At a range of 1 km it could still cover 400 m.
That meant that two or three Jagdpanthers, standing out of range of enemy guns, could cover a substantial battlefront and pickoff enemy vehicles at little risk to themselves, apart from air attack. The normal armour piercing round fired by the Jagdpanther weighed over 23 kg. It had a velocity of a thousand metres per second. It could penetrate over 150mm of sloped armour at a range of 1,500m. The only tank that would cause problems to the Jagdpanther was the Russian IS-2. It had 160 mm of frontal sloping armour. All other tanks, Russian or Allied, were easy prey. To fight this impressive weapon needed a crew of five. The crew compartment was roomy by the standards of the average tank and assault gun. The Jagdpanther's 88mm gun was slightly offset to give more space for the crew. The driver sat higher than the Panther tank driver. He did not have a separate escape hatch so this higher position enabled him a chance to get out quickly if necessary. The loader and the commander had separate hatches on the top of the vehicle. The strange kidney shaped hatch on the front left side of the roof was for the gunner's observation scope. The large hatch at the rear enabled the gun to be removed for maintenance as well as letting the crew get out fast in case of fire. The Jagdpanther saw action on the Russian Eastern front, Normandy and during the Battle of the Bulge. Although it was a superior weapon. there were were never enough of them do more than win local battles. Out of all the assault guns and tank destroyers that Germany produced during World War II, the Jagdpanther was the most competent.